Apple has moved to once again take the portable consumer communications industry by storm with its latest product launch. The company has announced a product that aims to make the well tested and hugely popular touchscreen technology of the iPad, so familiar in trains, airports and Starbucks across the world, readily accessible and even more portable. 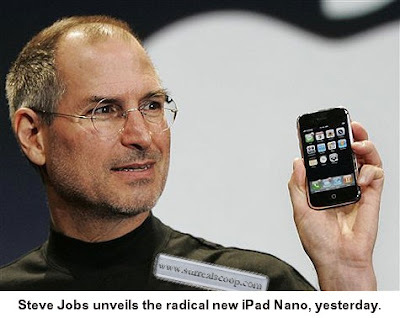 To the background of cheers and choreographed multi-touch ‘ZoomIn’ gestures, Mr Jobs unveiled the smaller, more compact iPad Nano at the exclusive mountain-top retreat known as ‘Apple Core’. Apple said that it was responding to rumours of criticism of the iPad: that it was bulky to carry around and its large and unwieldy display led to a battery life of a mere 10 hours. The iPad Nano boasts impressive specifications. It is half the height of the full size iPad, at 4.5 inches, and a third of the width, at 2.4 inches. Also revealed at Apple Core was that the multi-touch gesture for “disappear” is to slide one’s finger across one’s throat. Following the unease with which the Chosen Tablet’s name was received by the public, especially among women, the iPad Nano 3G will be sold under the name ‘iPhone’.